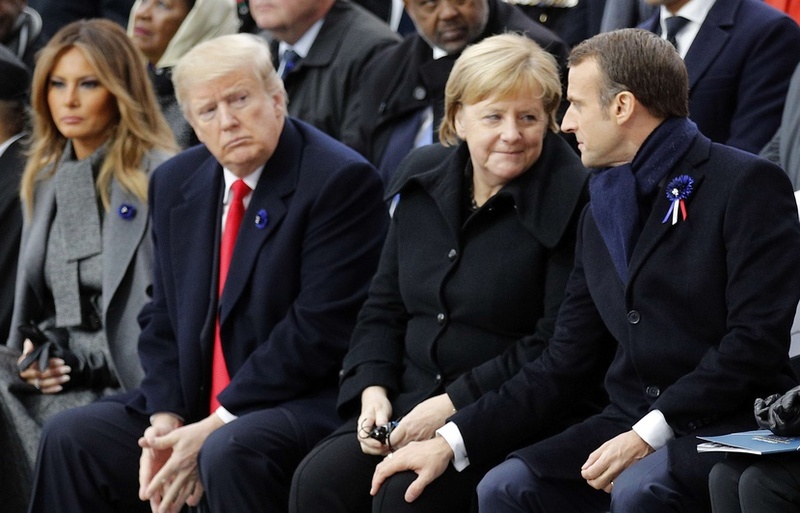 This great shot (by François MORI / AP) tells a lot about how differently close two couples can be, even when each member is only one chair apart from their partner. But don't get fooled. Merkel is on the way out, Macron remains dangerously low in the polls, and both are likely to receive major blows at the upcoming European elections. If Donald Trump lost the House, he did increase his control where it mattered most over the past few weeks: the Senate, and the Supreme Court. Without any moral leadership in sight (R.I.P. McCain, Flake, Corker), GOP lawmakers remain totally under his spell. They didn't lift a finger when Trump fired Jeff Sessions to illegally elevate to acting A.G. an open critic of Robert Mueller's Russia probe (Matt Whitaker), when Rod Rosenstein was supposed to get the position. Democracy is losing ground to nationalism, extremism, hatred. And in this world of strongmen, the free world doesn't have any strong leader in sight. But we do see and hear swarms of them. We do see inspiring new faces taking a stand for human rights or gun control, strengthening diversity in Congress. We do hear powerful voices, that resonate even more when they're silenced (Anna Politkovskaya and Jamal Khashoggi had Vladimir Putin and MBS expose themselves as murdering despots). And sometimes, we do see a majority of citizens cast a ballot against the destructive tide.